I realized that I need much more control over my assets than the Unity Asset Store can provide for “All Aboard!”. I need lots of low poly buildings and environments that have multiple iterations for upgrade purposes. The Asset Store is great, but certainly doesn’t provide EXACTLY what I need, so I need to create my own. Though I’ve never been a ‘designer’, I have a decent grasp on what it takes and I can learn as I go to polish up the skill set. It’s not much, but it’s my first attempt and I’m proud of it. I went through this tutorial multiple times, each time relying on it less and less to see if I could get through it alone. Trees and a mountain are nice, but not necessarily what I’m going to need for “All Aboard!”. 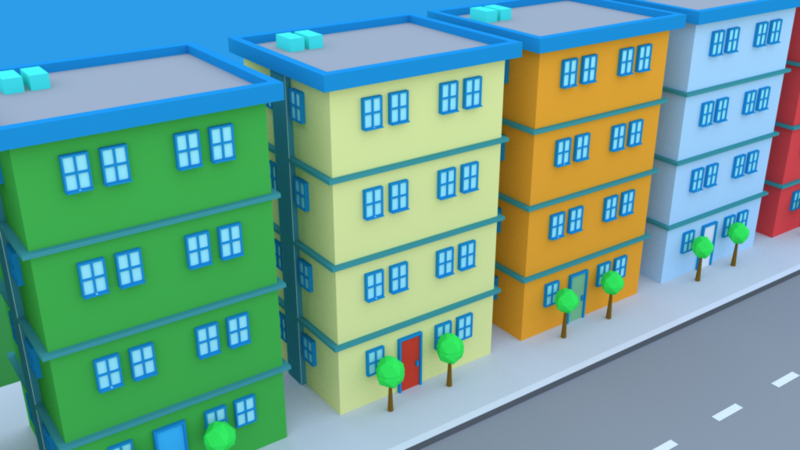 I need buildings, so I moved on to another tutorial on how to create low poly buildings. This one really helped me understand a lot of concepts needed for structures and how to manipulate objects to achieve certain effects. If you’re just getting started (like me), I highly recommend running through this one. Again, I went through the tutorial multiple times, each time trying to do it more and more on my own and ended up creating a nice little row of apartments. Nice! But I’m not building out a city block like this, I’m creating multiple buildings (or plots) for inclusion in a game, so I need to be more direct in what I’m creating. 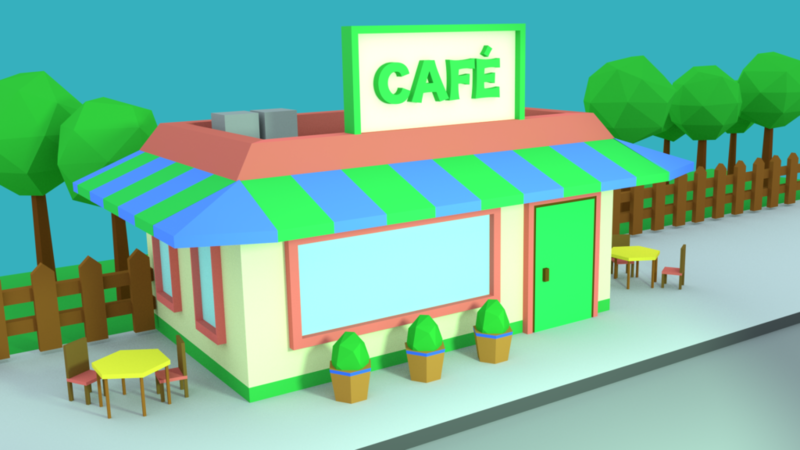 So I tried making a little Country Café to test out my abilities to create something from scratch without a tutorial guiding me through. I really like the café, but I know it could be better. I started noticing that there are some details missing. In the Country Café, I added a picket fence, some tables and chairs and a little planter. It’s still missing something, and the lighting is a bit off, but I’m pretty happy simply because I was able to do this on my own only after 3 days of working in Blender. I can do better, so I got to work on a Bank. 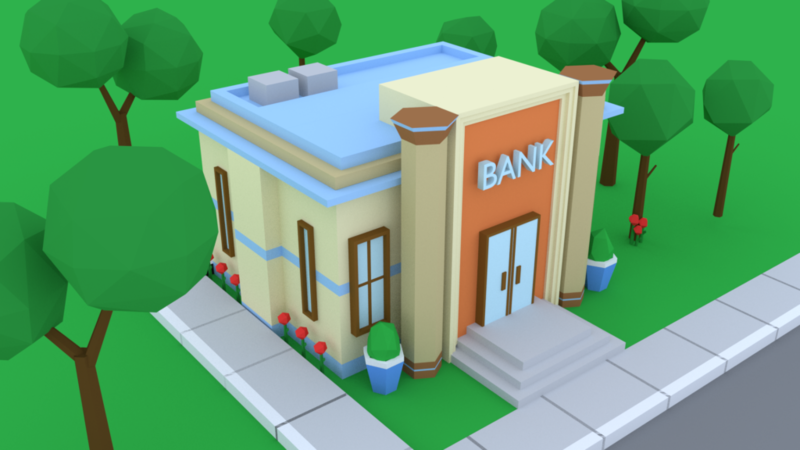 The Bank is most likely going to be an actual building in “All Aboard!”, so I’m taking a little more care to make it look how I want it to look. I spent some time modeling and getting the color palette right, rendered it and posted this version to reddit for some feedback. A few awesome people chimed in with suggestions like “the columns are cool, but don’t support anything”, and “maybe a few blades of grass”. The details are what they are commenting on, and I see clearly that something is missing from this version of the bank. I sat back down for a couple of hours to consider the details they brought up and ended up with a much better version of the bank. I think the second version looks 10x better, and can probably be improved 10x more, but I am very pleased with the results of this. Consistency – This goes along with scale and proportions, but anything and everything I create for actual use in “All Aboard!” has to have consistency! I’ve spent the past week (off and on) with Blender and I am having so much fun with it, but I must get focused as there are actual tasks in front of me rather than free-fun-time. But, I am most definitely looking forward to it! Follow me on Twitter, Facebook and Reddit for more updates on my 3D modeling progress and news about “All Aboard!” and “Stupid Aliens!”. Fascinating post and helpful as well. If you can share some details regarding how you textured / colored it? Did you follow a guide there too? 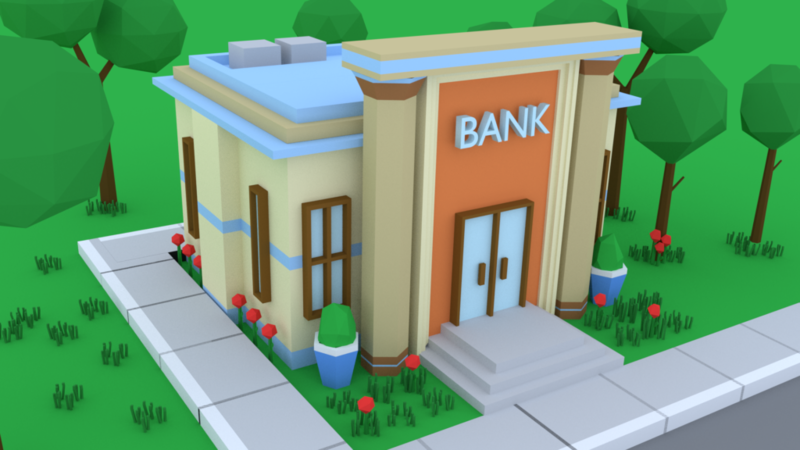 I really like how you colored the Cafe and the Bank. You inspire me. I’m currently working on developing a game myself and I can’t seem to get used to Blender and get everything how I want. Can you please share a little about how you colored / textured everything? Sure! 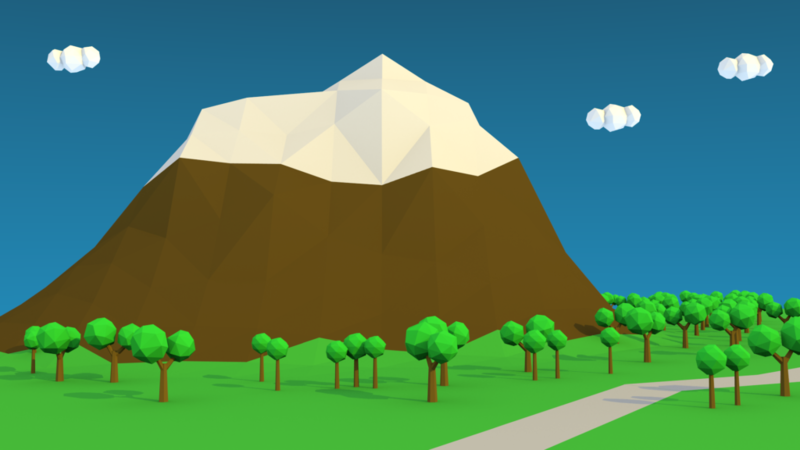 The first tutorial for the mountain scene taught me how to put the materials on the objects. I did not use textures at all in any of these, it’s all just colored materials. I recommend going through the mountain scene tutorial as it helped get me started. Do it a few times, each time with less and less help from it. You will eventually learn and things will come together for you! Keep me posted, I love to see things in progress! Thanks for visiting, and good luck to you!